War returned to the region northeast of Lake Ladoga around Tolvajärvi and Ilomantsi 18 months after Finland lost the Winter War, or Talvisota, in what Finns called the “Continuation War,” or Jatkosota. Defeat in the Winter War shocked many Finns; Finnish government and media had led the public to believe they were winning. While publicly carrying out the terms of the Moscow Treaty including the cession of considerable territory, the Finnish government almost immediately began to prepare for another war. The Soviets, for their part, continued to press the Finns for further concessions beyond those included in the peace treaty: the cession of Enzo, an important industrial center processing 80 percent of Finland’s wood pulp output (an important raw material in explosives manufacture). The right to send an unlimited number of troop trains across Finnish territory to the newly-acquired base at Hanko. The expulsion of the staunchly anti-Soviet foreign minister Väinö Tanner – the leader of the Social Democratic Party, who had been key in lining up working class support for the war - from the government. Demilitarization of the Aland Islands. Control of the nickel mines near Petsamo. Already bristling at these demands, only some of which were granted, the Finns looked on in terror as the Soviets followed up similar demands made on the Baltic States of Lithuania, Latvia and Estonia by annexing them outright in June and July 1940. 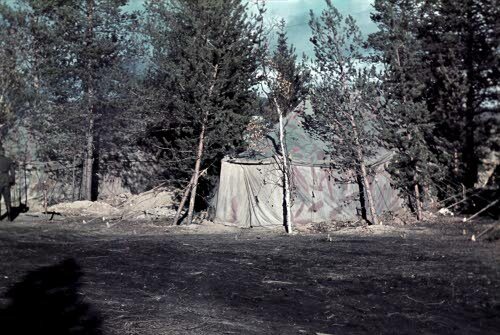 A German camp in Karelia reflects their idea of forest camouflage. The Finns responded by turning closer to Germany. In August they made a secret agreement allowing German troops to cross Finnish territory, supposedly so they could move to and from German-occupied Norway. The agreement was expanded in September to include German arms sales to Finland, and the first troop ships docked at the Finnish port of Vaasa on 21 September bearing both German soldiers for Norway and weapons for the Finns. Soviet foreign minister Vyacheslav Molotov visited Germany in November, telling Adolf Hitler that his country planned “a settlement on the same scale as Bessarabia” for Finland. The Soviet Union had annexed Bessarabia, a Romanian province, in August after occupying the region the previous month. The Germans duly passed this information on to the Finns. In December the Germans and Finns broadened their agreement to allow German troops to be stationed in Finland, and more and more of them began to arrive. Hitler ordered his general staff to begin planning for an invasion of the Soviet Union, noting that Finland would likely participate as an ally. Joint Finnish-German planning for a war of aggression against the Soviet Union began in January 1941, when Finnish chief of staff Eric Heinrichs visited Germany to give a series of lectures on the lessons of the Winter War. Staff talks continued through the winter and spring, and on 25 May Heinrichs and other Finnish generals met their German counterparts in Salzburg to iron out the final details. The Finns balked at joining the assault from the very first day, but otherwise accepted most German proposals. The Soviets would have to make the first move, so that the Finnish government could sell the war to its people as another defensive action. 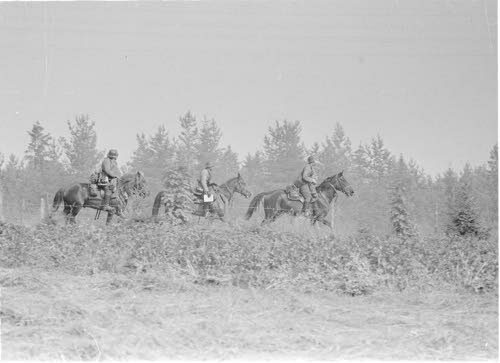 A Finnish mounted patrol near Tolvajärvi, July 1941. 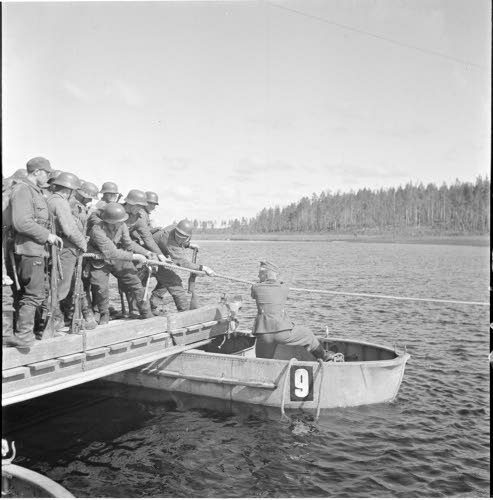 The Finns began partial mobilization on 9 June. A German liaison team joined the Finnish general staff on the next day, and on the 17th Finland declared general mobilization including the demilitarized Aland Islands. The Germans informed the Finns on the 21st that Operation Barbarossa would begin the next day. Finland officially declared neutrality in the new conflict, but Hitler stepped on that message by including a line that Finnish and German troops stood “shoulder to shoulder” in the Arctic. German Air Force planes began to fly sorties from Finnish airfields on the 23rd, and on the 25th the Red Air Force retaliated by opening a heavy air campaign of attacks against Finnish airfields and terror raids against Finnish cities. Supplied with their excuse, the Finns declared war on the Soviet Union on 26 June. The Finns attacked on multiple fronts, including across the old Tolvajärvi battlefield. They sent the elite brigades of “Group O” sweeping forward on a drive toward Petrozavodsk, capital of the Soviet republic of Karelia. The Finns met stout opposition on the same ground over which they’d fought in the Winter War. The Red Army’s 71st Rifle Division held the area. Formed in June 1940 from the former Finnish People’s Army Corps, the so-called “Red Finns,” the 71st had a high proportion of experienced men and Communist party members but was spread out over a long stretch of frontier. The 71st, commanded by Maj. Gen. A.M. Antilla, was headquartered in Petrozavodsk and intended to induct Karelians from the regions taken by the Soviet Union from Finland after the conclusion of the Winter War. In practice the Red Army distrusted these conscripts and relied on Red Finn survivors of the Winter War to man most of this division. The Red Finns faced the elite Finnish 1st Jäger Brigade and the German 163rd Infantry Division, which had just begun to arrive from its previous task of garrisoning German-occupied Oslo, Norway via train across Sweden, touching off a political crisis in that country. The Germans moved fairly swiftly across Sweden, and then piled up at Tornio on the Finnish border to await transportation south. Finnish locomotives burned wood rather than coal, greatly reducing their carrying capacity, and the German division arrived at the front very slowly. Gen. Erwin Engelbrecht’s division needed about 80 trains for full transport, and the Finns could manage to give him at most three per day. Red Finnish patrols crossed the border as soon as the Axis began their attack on 22 June 1941, but found the frontier zone emptied of civilians. They encountered Finnish border guards who politely asked them to leave, and eventually German troops who engaged them in a series of firefights. Apparently the Germans crossed the border first, engaging the Soviets on the night of 24-25 June. Finland declared war on the Soviet Union on 26 June, and Finnish troops began to probe Soviet positions on the 28th. Forced to wait for at least some of the Germans to arrive, the main Finnish offensive in this sector did not begin until 10 July; by that time, the Soviets were fully alerted and ready for battle. The Soviets held their ground at first, repelling both Finnish and German attacks. Lacking reserves and spread very thin, the Soviet division began to give ground but denied the Axis a breakthrough. Unhappy with the performance in this sector, the Finnish VI Corps commander Paavo Talvela, hero of the 1939 Battle of Tolvajärvi, claimed that the German division was “not up to Finnish standards.” The division’s piecemeal arrival on the battlefield probably had something to do with that, and the “brothers in arms” (Finland and Germany were not formally allied) traded accusations over the 163rd Infantry’s poor performance. Talvela also sacked 1st Jäger Brigade’s commander, Col. Urho Sihvonen, and brought back its former commander, Talvela’s friend Ruben Lagus (always referred to in German communications as the less-Jewish-sounding “Ernst” Lagus), then in charge of 5th Infantry Division. Lagus pressed the brigade harder, scoring much greater gains matched by higher casualties. The Soviets now fell back, but still offered stuff resistance. German pioneers bridge the Tolvajärvi Strait, late July 1941, using the boats that survived Sgt. Tikiljainen's fierce defense. On the 28th, a German assault on the eastern shore of Lake Tolvajärvi ran into prepared positions held by Junior Sergeant Peter Tikiljainen’s platoon. Tikiljainen and his men repelled repeated assaults throughout the day, coming both through the woods and on rubber assault boats across the lake. When their ammunition was finally exhausted, Tikiljainen and his three surviving riflemen, all of them wounded, charged out of their trench into the shallows shouting “For the Motherland!” Tikiljainen tossed their last grenade into a German assault boat, killing all aboard, and he and his men engaged the Germans from other boats in a savage bayonet fight before the sergeant was killed and his men subdued. Tikiljainen would be named a Hero of the Soviet Union, with a statue erected in his hometown of Suojärvi (annexed by the Soviet Union in 1940 and re-named Suoyarvi). While Tikiljainen’s 53rd Rifle Regiment continued to manhandle the German division (with the help of an artillery battalion), the Finnish jäger brigade pushed back the rest of the 71st Rifle Division off the edge of the Winter Fury map and eventually back to the Petrozavodsk, the capital of Soviet Karelia. The 163rd Infantry Division was pulled back into reserve and eventually transferred to a quieter part of the front, while Lagus and his brigade prepared for a further operation against Petrozavodsk. 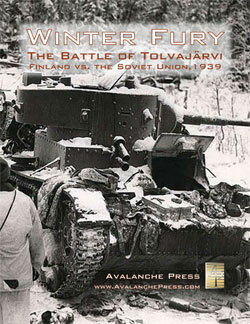 The Playbook edition of Winter Fury includes a scenario for the 1941 battle. The Finnish player, with German help that may or may not arrive on the battlefield in time to make a difference, has to push the Soviets off the map. The Finns are outnumbered, and the Soviets – many of whom are also Finns – aren’t of a mind to leave easily. The more interesting fighting took place off the lower left side of the map, but it still makes for a very mobile, wide ranging look at forest fighting. Click right here to order Winter Fury. Mike Bennighof is president of Avalanche Press and holds a doctorate in history from Emory University. A Fulbright Scholar and award-winning journalist, he has published over 100 books, games and articles on historical subjects. He lives in Birmingham, Alabama with his wife, three children, two turkeys and his dog, Leopold. Leopold argues with the turkeys.